Untap target creature. It gets +2/+4 and gains reach until end of turn. I personally would say that Glorybringer is one of the better Exert creatures, mainly due to the haste, and the somewhat built-in removal, so to speak. 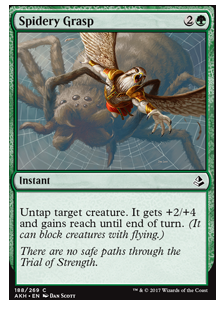 Have you considered buff spells such as Prepare / Fight, Spidery Grasp, and Synchronized Strike that untap creatures? 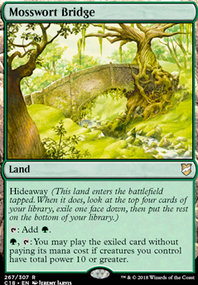 Or, heck, Gideon, Martial Paragon if this isn't a paper Magic deck. 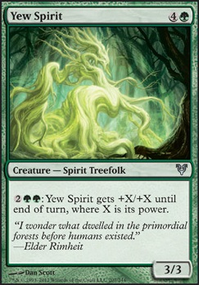 Until you draw into Always Watching , you will probably need untap spells like Synchronized Strike, Spidery Grasp, Prepare / Fight, and Gideon, Martial Paragon, since exerting creatures tends to slow the deck down. I definitely would say that Ahn-Crop Crasher and Glorybringer are the better Exert creatures, mainly because they have haste, and hence can land some damage before getting removed. Appreciate they are one use, but they can provide quasi-vigilance and may end up removing the pesky flyer. They also trigger Silverfur Partisan bringing in a surprise blocker. I'd be intrigued to know how this build performs. I'd consider including something like Shock that doubles up as target removal and hitting in for those last two points of damage after a heavy strike. Additionally Vines of the Recluse is a variant of Aim High that has the advantage of a lower mana cost. There's also Spidery Grasp that has a similar function. 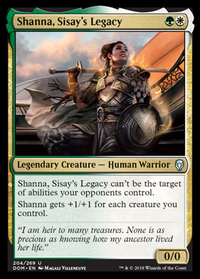 I personally would also include Bitterblade Warrior , especially with that deathtouch ability, and maybe Champion of Rhonas for a slower, standard legal version of Elvish Piper. To make space for these cards, I would probably cut Ahn-Crop Champion, since his ability is essentially nullified when you have Always Watching . You can also run some cards that untap your guys like Prepare / Fight, Spidery Grasp, and Synchronized Strike so you can abuse your exert creatures the next turn. 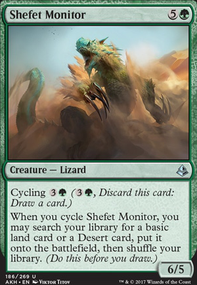 I would also probably suggest cards that give your creatures haste such as Bloodlust Inciter and maybe Cartouche of Zeal, mainly because of the fact that cards like Fatal Push and Unlicensed Disintegration aren't going to rotate out anytime soon.